Dubai, UAE; February 28, 2018: Landmark Group has announced the launch of VIVA, the Middle East’s first food discounter. Responding to the needs within the community, the 44-year old retailing group led by Renuka Jagtiani, Chairwoman & CEO, has once again seized the opportunity to deliver exceptional value to its customer, through the launch of the region’s first food discounter brand, VIVA. With the launch of VIVA, Landmark Group would be pioneering the concept of food discount retail in the Middle East. The brand will offer a range of private label quality products for at least a 30 per cent cheaper shopping experience. The first VIVA store was launched today in Grand Avenue Retail and Residence, Sharjah, in the presence of His Excellency Sultan Abdullah bin Hadda Al Suwaidi, Chairman of Sharjah Economic Development Department. The opening at Grand Avenue was the first of four simultaneous openings in Sharjah, Ajman and Dubai, making it convenient for customers living in different communities across the UAE to have easy access to VIVA outlets from day one of the launch. 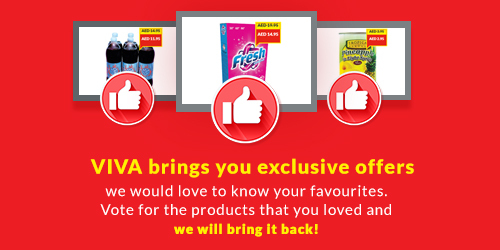 This launch will be closely followed with 11 more VIVA stores opening across the Emirates in the coming months. The stores will operate in high density neighbourhoods to offer better and convenient shopping to customers. Each store will carry a range of more than 1,200 products that will cater to a customer’s full shopping trip. Inaugurating the first store of VIVA, Chairwoman and CEO of Landmark Group, Renuka Jagtiani, said: “I would like to thank the visionary leadership of the UAE for their support, and this opportunity to introduce VIVA as the first food discounter in the region. “Landmark Group has been built on the philosophy of listening to our customers and enriching their lives by offering meaningful quality products to them, that bring them great value. The launch of VIVA is one more step in our journey to create value in the communities we serve. Georg J. Fischer, CEO, VIVA, said: “A food discounter concept is powerful and disruptive; customers will experience a different way of shopping where the highest quality at cheapest prices is found in a compact format all at one place. They get in and out of our stores effortlessly thus saving them time and money. “The products at VIVA have been hand-picked by a team of experienced professionals, sourced from the best markets in Europe and Asia, offering only the freshest and highest quality to our customers in the Middle East. VIVA opened its doors to customers with exciting activities and rewards, such as the FIRST 100 customers who received Golden Gifts from VIVA comprising of 55-inch LED TVs, digital gadgets, electrical appliances, VIVA food hampers, cash vouchers and many more, in every store. In addition, customers also got AED10 discount vouchers and free products to take home. Founded in 1973 in Bahrain, the Landmark Group has successfully grown into one of the largest and most successful retail organizations in the Middle East and India. An international, diversified retail and hospitality conglomerate that encourages entrepreneurship to consistently deliver exceptional value, the Group operates over 2300 outlets encompassing over 30 million square feet across the Middle East, North Africa and the Indian sub-continent. Landmark Group has a strong workforce of over 55,000 employees and provides a value-driven product range for the family through its retail concepts: Centrepoint, Babyshop, Splash, Shoe Mart, Lifestyle, Iconic, Max, Shoexpress, Home Centre, Home Box and Emax. In addition to the brands developed in-house, the Group also holds the franchise rights for some of the world’s leading fashion and footwear brands in the countries where it operates. The Group has also diversified in the leisure, food and hospitality with Landmark Leisure, Citymax Hotels, Fitness First and Foodmark, the restaurant division, which operates the Group’s own and franchise food outlets.